Most dog owners know how important a dog crate can be for their four-legged friend. Dog crates not only create a comfortable and safe space for your pet, but they can also be one of the most useful training tools available. If you’re in the market for one of the best dog crates available then you've come to the right place! Today we'll be delving into the ins-and-outs of dog crates so read on for in-depth reviews, a comprehensive buyer’s guide and answer to frequently asked questions. 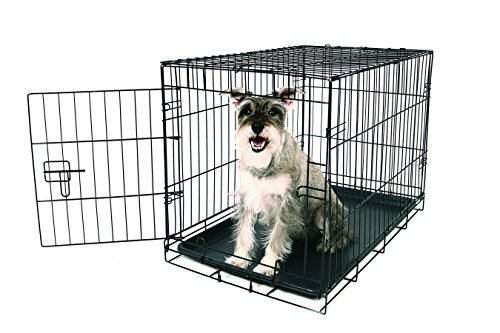 What Size Crate for My Dog? The home brand behind one of the biggest companies in the world, AmazonBasics has now expanded its range from simple electronics to office accessories, kitchen items, and even pet supplies. 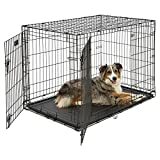 The AmazonBasics Folding Metal Dog Crate is a great entry-level crate, offering a super-fast setup and easy storage options. 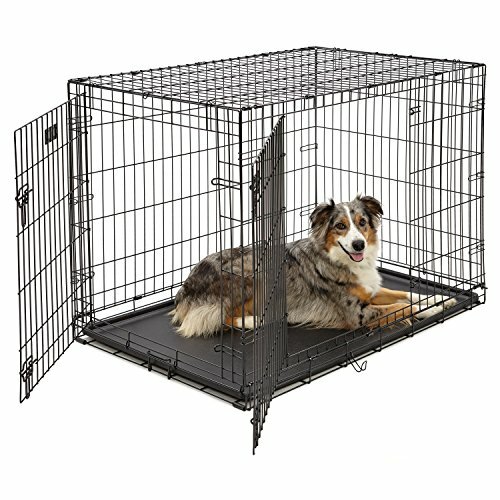 Featuring a durable metal-wire construction and available in both single and double door varieties with six size options, there’s a lot to like about this budget crate. Two slide bolts secure the door to provide great security, while a plastic tray creates a base for your pet. AmazonBasics has included a divider panel that allows owners to adapt the space to their pet as it grows. This can also be used to separate the sleeping and bathroom sides of the crate to make cleaning a little easier. 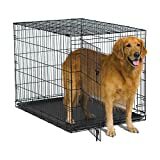 The AmazonBasics Folding Metal Dog Crate can be set up and taken down easily in only a few seconds. The foldable design and loop handle allow for compact storage and maximum portability. On the positive side, there’s plenty of varieties to suit almost any breed, big or small. The included composite plastic tray makes clean up a breeze, and the handle allows for easy storage. As this is an entry-level product, some larger breeds may be too strong for these crates. The flimsy plastic tray may spook more sensitive dogs due to the sound created when a dog walks on it. If you’re after a crate that offers something a little different, have a look at the MidWest Homes iCrate Folding Metal Dog Crate. This versatile entry-level crate is available in three color options (satin black, blue and pink) and features roller feet to help protect your floors. The design was front of mind when MidWest created the iCrate. Their patented round-corner clips remove the possibility of sharp point injuries while also keeping the crate secure. A heavy-duty slide bolt secures the doors and a Pan Stop latch keeps the included plastic tray in place while allowing for easy removal for cleaning. An included divider offers extended use of the crate, and should anything go wrong MidWest also include a 1-year manufacturer's quality guarantee. This is a great entry-level crate but should you have a bigger or stronger dog, you may be better suited to MidWest’s other crate offering, the Life Stages, which uses a heavier gauge steel (see below for review). The strongest points of the iCrate are the design, protective rounded corners, roller feet, and manufacturer's guarantee. While there are three colors to choose from, the pink and blue finishes are only available for the single-door 24" model. All dog owners know their dogs like their own space, curling into a ball under a table or chair to sleep. While it's not always easy creating the perfect space for your pet, with the New World Folding Metal Dog Crate you can do just that. With an abundance of available accessories, it's easy to make a customized space just for your pet. Featuring large doors with low thresholds for easy entrance and exit, New World offers single and double door options with sizes available from small (5kg/11lbs) to extra-large dog breeds (up to 50kg/110lbs). The durable wire construction will keep your pet safe and secure, with a 1-year guarantee backing up the quality. This folding metal crate assembles easily without any tools, and like other crates can be folded down for storage. Two easy-to-use slide bolt latches keep the doors in place, and the inclusion of a Pan Stop makes removal of the plastic pan quick and easy. New World has built their crates to specifically fit a number of accessories, allowing for greater customization to create the perfect space for your pet. Optional accessories must be purchased separately, as the crate comes with only basic items. 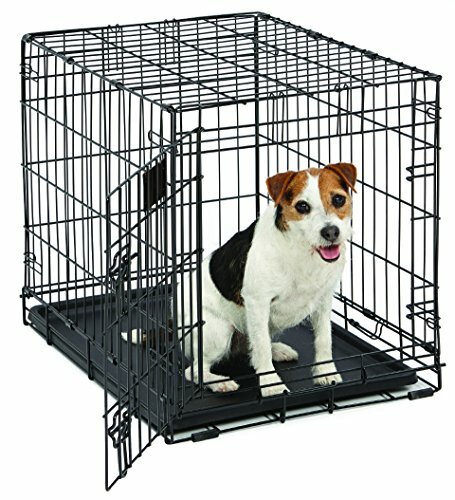 Buying a crate that can stand the test of time is not only important to your pocket, but it also helps give your dog a place it can call its own throughout its life. With this in mind, MidWest developed the Life Stages Folding Dog Crate, one crate for all stages of your dog's life. Designed around the safety and comfort of your pet, the Life Stages crates are built to last a lifetime. By using heavier gauge steel and tighter mesh than its smaller cousin, the iCrate, MidWest has beefed up the construction while keeping it easy to set up and pull down. The folded crate is easily transported with the included snap-on plastic handles. As well as the sturdier construction, the Life Stages crate includes a divider, allowing owners to vary the size of the crate as their puppy grows. According to MidWest, house training time is halved by separating elimination and sleeping areas. The MidWest Life Stages Folding Dog Crate is available in six sizes with single or double door options and features heavy duty slide latches, rounded corners, a washable pan, and pan stop to make cleaning simple. As with all MidWest products, a 1-year manufacturer's warranty is included for extra peace of mind. The brightest points are the heavier gauge steel and tighter mesh, combined with the included divider to allow for many years of use. Due to the heavier gauge steel, this crate is somewhat heavier than its competitors. Carlson Pet Products started when the owners couldn't find any decent dog gates for their pets. Instead of using baby gates, they developed a line of specialty dog gates, and over the years expanded into other pet products including crates and beds. Durable, foldable and portable, this is one of the best budget dog crates you'll find. The Carlson Foldable Dog Crate has an all-steel construction, with chew-proof durability and non-toxic materials so you can be sure your pet is safe. 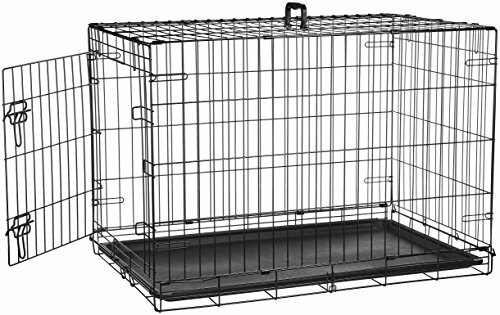 Available in most dog sizes (small to extra-large), this crate is only available with a single door. The double bolt locking system helps keep your pet safe, and the inclusion of a thick removable plastic tray allows for quick cleaning. The pan itself locks into the crate to ensure nothing spills onto the floor. Like most foldable crates, the steel construction is robust but may not be suitable for very strong or aggressive breeds. The best aspects of this crate are the durable steel construction and easy portability. As a divider is not included with this crate, it may be limited to either puppies or adults, but not for lifetime use. Or you may buy or build your own divider. Selecting the best dog crate for your needs can be a daunting task. With a variety of available styles, sizes and uses, it's sometimes difficult to know where to start. But with some basic information, you'll find the perfect crate for your (and your dog’s) needs. Many people simply want to create a space for their pet, while others are moving overseas and need an air travel approved crate. Different crates have different uses and knowing which crate is right for you will make the selection a lot easier. Dog crates are generally designed to last, but a crate for a 5kg Maltese will be very different to one needed for a 50kg German Shepherd. Selecting the right type of crate also requires looking at the construction materials to ensure your pup is secure in their new home. When creating a home for your furry friend, you will need to consider where their crate is kept, and can it be moved easily should the need arise. Many crates include wheels for easy mobility while others collapse entirely for storage and travel. Every dog crate needs to be cleaned. While most of the time this is quick and easy, some crates are harder to clean than others. Check that the pan can be easily removed and what material it's made of. Plastic and rustproof metal pans are easily washed and won't need a great deal of scrubbing. Below is a list of the different types of dog crates available and how each can be best used for your pet. Commonly aimed at giant dog breeds like Great Danes and Mastiffs, heavy duty dog crates are designed for bigger dogs and those who manage to escape or destroy their standard crate. Often touted as ‘escape proof’ or ‘indestructible,’ heavy-duty crates are much stronger than other styles, often reinforced with steel tubes for added security. The quality of heavy duty crates is what really sets them apart. Galvanized steel floor pans, aircraft-grade aluminum sides, and multi-layered finishes are commonly featured, along with solid (but ventilated) sides for extra protection. As heavy-duty crates are made of thicker steel and stronger materials, they can be more expensive than other types. However, they are often much better quality than cheaper crates and pay for themselves if you have to replace a less sturdy crate multiple times. Another important note for heavy duty crates is mobility. These can be much heavier than other styles so if you'll have the need to move the crate, make sure to look for a product that has wheels, or is collapsible. Some heavy duty crates also offer the dual role of being IATA compliant, meaning they're approved for air travel. This can be a big saving if you're flying with your pets as airline approved crates often sit on the higher end of the market. On the opposite end of the spectrum to heavy-duty crates are soft dog crates (or soft-sided crates). Often made from nylon or canvas on a metal frame, these crates are generally designed for smaller breeds, but can also be suitable for calm larger dogs. As they are far from escape-proof, these crates shouldn't be used for initial crate training – a puppy crate (or foldable wire crate) will be a much better option. Soft-sided crates provide dogs with a greater sense of security while allowing for good visibility and airflow due to open or mesh-covered sides. Because of the soft fabric sides, dogs that chew or claw at their crates may find a better fit in a different style. As they are made of fabric, they can also be notoriously difficult to clean – something to keep in mind if you have a younger or messy dog. Great for outdoor events, camping and picnics, soft crates allow your pet to have some space to call its own without the bulk of other crates. Lightweight and generally collapsible, these crates are easy to take on your travels; just keep in mind they're generally not suitable to be used while traveling in vehicles. These crates often have two uses: a place for your pooch to call home, and as a nice piece of furniture! Wooden dog crates can be a great addition to your home, making the crate integrate seamlessly into the rest of your living room furniture. Stylish and often on the higher end of the budget, wooden crates are not suited to all breeds or dogs. High energy dogs, anxious dogs and power chewers will likely find a better home with another crate style. Wooden crates should only be used for dogs that are already accustomed to crates and never as a training tool. While providing additional functionality by doubling as a side table, this style also has limited mobility. In order to have your dog travel on a plane, either in the cabin or as cargo, you will need to have an International Air Transport Association (IATA)-certified dog crate. These crates need to meet safety standards set by the IATA to ensure your pet travels safely and comfortably on the plane. There are two types of airline approved travel crates– soft (for smaller dogs that are permitted to travel in the cabin) and hard (for the majority of dogs). While some airlines will permit small dogs to travel in the cabin on certain routes (domestically or within certain regions), this isn’t generally permitted on long-haul international flights so most animals will need to travel as cargo. When traveling as cargo, your pooch is placed in a temperature-controlled, pressurized space directly under the main cabin (with other live animals, musical instruments and other sensitive cargo). The crates are then tied down to prevent any movement during the flight and to keep your pet safe. Many airlines also require cable ties to be in place around the crate to ensure maximum safety. Airlines also have their own regulations regarding pet crates, so make sure you check with your agent or airline prior to purchase to ensure your crate will be compliant. Airline-approved crates can be some of the best dog crates on the market due to their durability and lifespan. As they’re often made in two halves (top and bottom, secured with pins around the middle), after travel these can be pulled apart and used as beds for your pups or stacked together for storage. One of the most popular crate styles available is the puppy crate, otherwise known as foldable metal crates. Their popularity is rightly deserved, with many crates being able to be used from puppy to adult dog thanks to the inclusion of a divider panel. These panels reduce the size of the crate to accommodate a growing puppy, and can also separate the sleeping and bathroom areas of the crate. 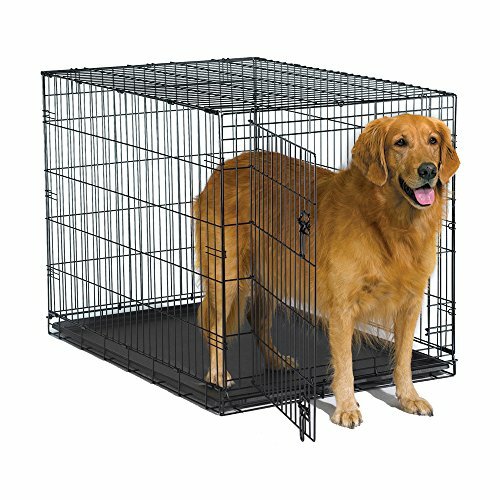 Available with one, two and even three doors, these metal-wire crates help your pet feel safe by giving them their own enclosed space. Plastic or metal pans are included to prevent accidents spilling to the floor, and slide bolts, rounded corners, and coated metal help prevent any injuries (to two or four-legged friends). Puppy crates can be an invaluable training tool due to a dog's natural instinct to be in a den. Scared and anxious pups often find refuge in their crates, and many experts believe crate training to be one of the most effective ways to house train, prevent destructive behavior and encourage downtime for our dogs. The dog should be able to sit without hitting its head, turn around without hitting the sides, and lay down and stretch out without being cramped. Intermediate – 36” (91cms). Suited to medium/large breeds such as the Bulldog, Beagle and Portuguese Water Dog weighing between 41-70lbs (18-32kg). Keep in mind that size is generally more important than weight, and be sure to always check the manufacturer's guidelines and measurements when buying your crate as these can vary. Looking at the above list should give you an idea of what size crate you’ll need to get, but it’s imperative you measure your dog to ensure they will be as comfortable as possible. Measuring your dog is best done with a tailor’s measuring tape (or another soft tape), but any measuring tape long enough to give you an accurate result should work. To measure length (A), have your dog stand up on all four legs and measure from the tip of their nose to the base of their tail (not the tip of the tail as this will be too big). While they’re on all fours, measure from the elbow joint to the ground to get the B measurement. Next, measure from shoulder to shoulder to get the width (C) measurement. Finally, have your dog sit and measure from the highest point of their nose when raising their head to the floor for the standing height (D). This method is used by most pet transport companies to determine the correct crate sizes for their clients. Picking the right type of dog crate could be the difference between a happy and scared dog. The wrong choice could be a disaster for you and your pup. When choosing a new crate for your pet, you need to ask yourself a few questions first to make the right choice. What is the purpose of the crate? Do you have an anxious pup who needs somewhere to shelter to feel safe or are you planning on traveling with your pet overseas? Whatever the reason, make sure you select a style of crate that is built for that purpose. A soft crate might seem like a great idea for your big dog, but there's a good chance they'll chew through it very quickly. Once you know the main purpose of the crate, you can ask yourself, where will the crate be stored? Will I need to move the crate around or travel with it? What sort of materials do I want? Answering these questions should give you enough information to select the most appropriate style of dog crate. The final step is to measure your dog and select your crate. When setting up your dog’s crate, it’s important to keep the dog’s safety and comfort in mind. The first thing you need to do is decide where the crate will be kept. It’s best to put this somewhere people frequently visit, such as the living or family room so your pup doesn’t feel isolated and to help them get used to being around people. Assuming you have a crate that needs assembly, follow the included instructions to set the crate up. Puppy and soft dog crates generally just expand into their full form, and most crates require no or minimal tools to be set up in a matter of seconds. Ensure the crate is sturdy, all locks are secure and check for any sharp edges if you have a metal crate. These should be filed down to avoid any injuries to you or your pooch. Dog crates are like dens or homes for our dogs; you want to make an inviting space for them without making it cramped. If you’re still house training your puppy, keep the crate empty with the exception of a small toy to chew. Once they’re house trained, it’s best to furnish the crate with a soft dog blanket and one or two toys to keep them entertained. We may think of our pets as smart but they’ll definitely need a little assistance to set up and collapse their crates. The best dog crate manufacturers think about both their human and dog clients when building their products, and have thankfully made collapsing and storing dog crates very easy. Ensure your dog and everything else is out of the crate and close and lock the door(s). Fold down the front side. You will find metal tabs holding the top in place, press down on the crate to release the tabs so you can unlatch this side and fold down to the base. Repeat this process to fold down the back panel. Once the small sides are folded, push the crate over to one side so it is flat to the floor. The remaining side can then be folded over and latched to keep everything together. If not already attached, add the included handles to make it easy to carry. Foldable crates take up minimal space once collapsed and can be easily stored under sofas or beds. Whatever your need, a dog crate can be the perfect space for your pet, and training them to use the crate is just as important as the selection process. Many dogs initially fear crates so try luring them in with a treat to get them excited. With time and patience, your dog will love their new space. Dog crates come in many different styles and are used for just as many reasons. Whether you have a new puppy that you're trying to house train or an adult dog that needs a new place to rest their head, finding the best dog crate for your pet doesn’t need to be a chore. By answering a few simple questions, you can find the perfect crate for any dog. Should You Cover a Dog Crate with a Blanket?